Several years ago, we planted a few grape plants on a fence that divides our property from our neighbors. This is actually the first year that we have had success in growing a sizable crop of Concord grapes. In the past, as the late summer heat would coax the grapes to ripen, the deer would wait for the opportune time to mosey over to the vines and demolish the crop in one short evening. M and I would get giddy over the dark purple grapes that were just about ready to be picked and the very next day, they would be completely gone…ripped from the vines by the much more experienced deer. As my husband was out mowing the lawn this weekend, he noticed that the majority of our grapes were just about ready to be harvested. 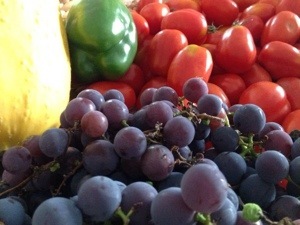 M and I grabbed all of the available baskets and headed outdoors to pick our crop. We were delighted with the over abundance of fruit. My hubby even joined in knowing that we only had a small window of time to pick the fruit before the deer would come along and swallow up the lot. 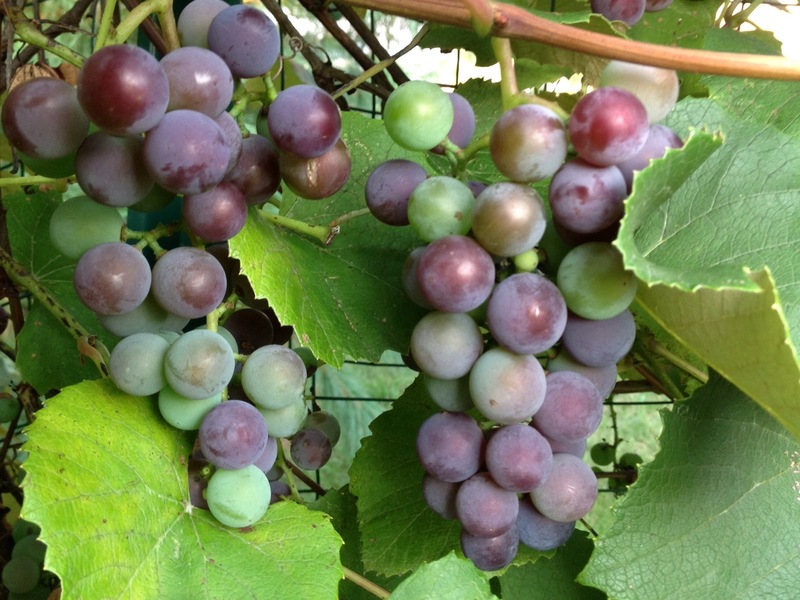 This long holiday weekend will bring lots of late summer heat but I am anxious to get my grapes prepared to make batches of Concord grape jelly. While I have been canning for years, I have never tried processing seeded grapes to make jelly. I always rely on the Ball Blue Book to carefully and safely process canned goods. Since this is the first year that we have had a sizable crop, I have searched for recipes all over the Internet. I think I have settled on one or two that I will try. If any of you have a great grape jelly recipe or a few tips that you would like to share…please do so in the comments section of this post. I am hoping to successfully report back in a future post, news about the products of my labor. I loved looking through your blog! 🙂 It’s great! You are so kind! Thank you for visiting. I’ll be stopping by your blog to see what’s happening with you as well. I rarely sign up for new blogs by email, but you reeled me in! Great selection of easy family recipes! I’m flattered, Natalia! Thanks for following my blog and for visiting my site. I will be sure to check out your blog as well. 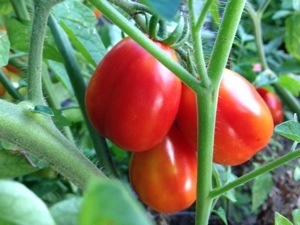 Have you tried to make tomato preserves from those larger grape tomatoes? I’m have quite a few of them and they are so nice and sweet. I’m thinking tomato preserves! Isn’t that funny? It happens to me all the time… I see a post and it sparks a memory or a recipe that I want to include in my blog. Thanks for your kind comment!